(Kīlauea, Kauaʻi, Hawaiʻi) — In 2018, conservation partners again provided a new home, safe from invasive predators, for some of Hawaiʻi’s most imperiled seabirds. 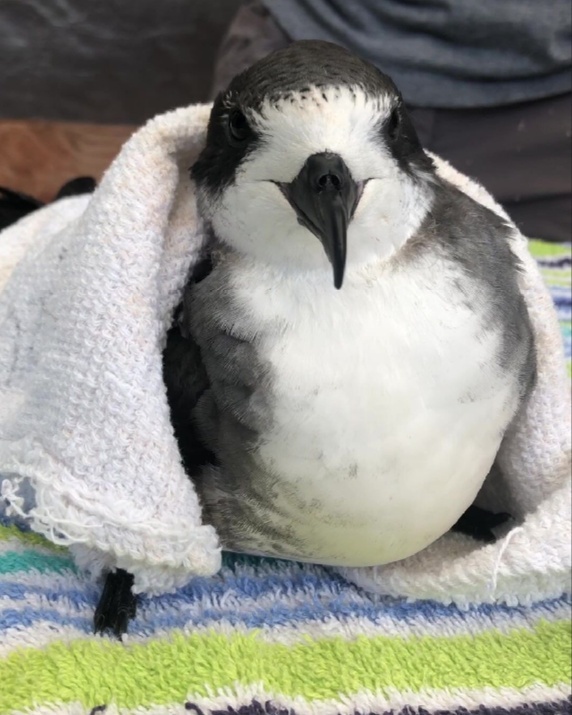 A total of 39 chicks, including 20 endangered uaʻu (Hawaiian Petrel) and 19 threatened ʻaʻo (Newell’s Shearwater), were moved from colonies in the mountains to the translocation site, called Nihokū, at Kīlauea Point National Wildlife Refuge. In this location, they are protected by a predator-proof fence surrounding the Nihokū restoration site. Over the course of several weeks, the chicks are fed and cared for by a dedicated team of biologists and volunteers until they fledge – finish molting into adult plumage and fly off. Over the last four years, 112 chicks have successfully fledged from the site. The chicks will spend a few years at sea before returning to the exact area where they were raised, hopefully establishing a new seabird colony at Nihokū. All of the translocated chicks were collected from colonies located in the rugged, mountainous interior of Kaua‘i, where the birds are under threat from introduced predators, including feral cats, rats, and pigs, as well as loss of breeding habitat. These dangers, coupled with collisions with power lines and attraction to artificial lights, have dramatically reduced populations of the uaʻu and ʻaʻo on Kauaʻi. The effort to create a new, fully protected colony of these birds at Nihokū is part of a larger effort to protect the two species and help their populations recover. The 7.8-acre translocation site is protected within a predator-proof fence. Made with very small, woven, stainless steel mesh, buried three feet underground, and with an upper hood that prevents the incursion of predators, this is one of the best tools available for conservation of seabird colonies. Such fences now are more frequently used as a hedge against introduced predators plaguing native birds, plants, and even small endangered tree snails in Hawaiʻi. The project has not been without its challenges. This year a record-breaking rain event in mid-April swept across the island, flooding the nearby Hanalei Valley and part of the refuge. An estimated 49.6 inches of rain fell in 24 hours, nearly blowing out a drainage culvert under the protective predator-proof fence. In addition, Hurricane Lane drove in more rains in mid-August. Lindsay Young, executive director for Pacific Rim Conservation, who led the project to build the fence, attributes part of the success to good design: “The record rainfall this year had minimal impacts on the fence as a result of design features that allowed water to exit the fenced area.” All partners are grateful for the help of dedicated volunteers, who helped to keep debris away from the drainage culverts, keeping Nihokū predator free. Other challenges came from the birds themselves. “Each chick has its own personality, and more often than not, they are just plain feisty, which makes daily care a challenge,” says outreach coordinator for Pacific Rim Conservation Leilani Fowlke. These seabirds spend their first four to five years at sea and the partners are anxiously waiting for the first translocated birds to return to the site to breed — the ultimate measure of success for the project. In spring 2019, the first cohort of petrel chicks — nine birds that fledged in 2015 — is expected to return. The partners hope that they will establish Nihokū as a breeding site and create the next generation of seabirds for this area.